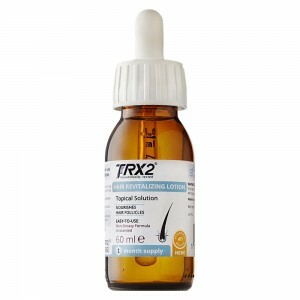 Painless, cost effective and long-lasting results. When it comes to hair removal, allow the efficient performance of the luxurious Silk’n Glide 150,000 to outshine any other method you may have tried. 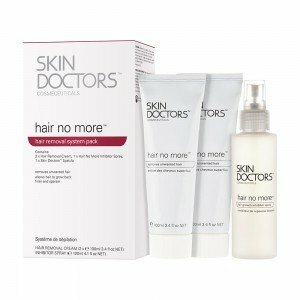 It uses revolutionary patented Home Pulsed Light (HPL) technology to impair hair growth to reveal silky smooth skin. 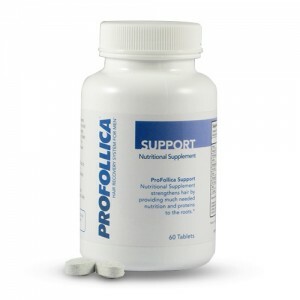 Users reported enjoying up to 50% hair reduction in just 3-5 treatments. Plus, this attractive device comes in an equally stylish, multipurpose case and soft cloth for cleaning. 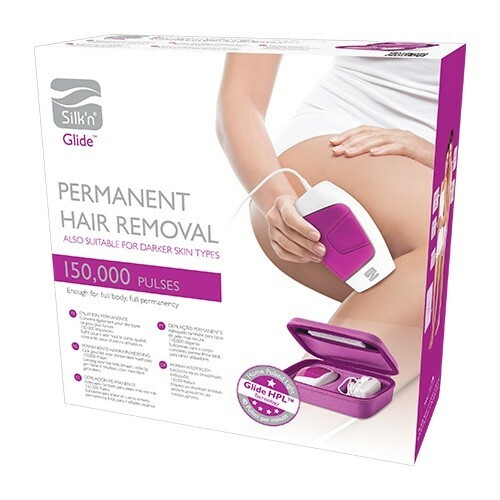 Order your Silk’n Glide 150,000 laser hair removal device today by 4pm, to take advantage of our next day UK delivery! 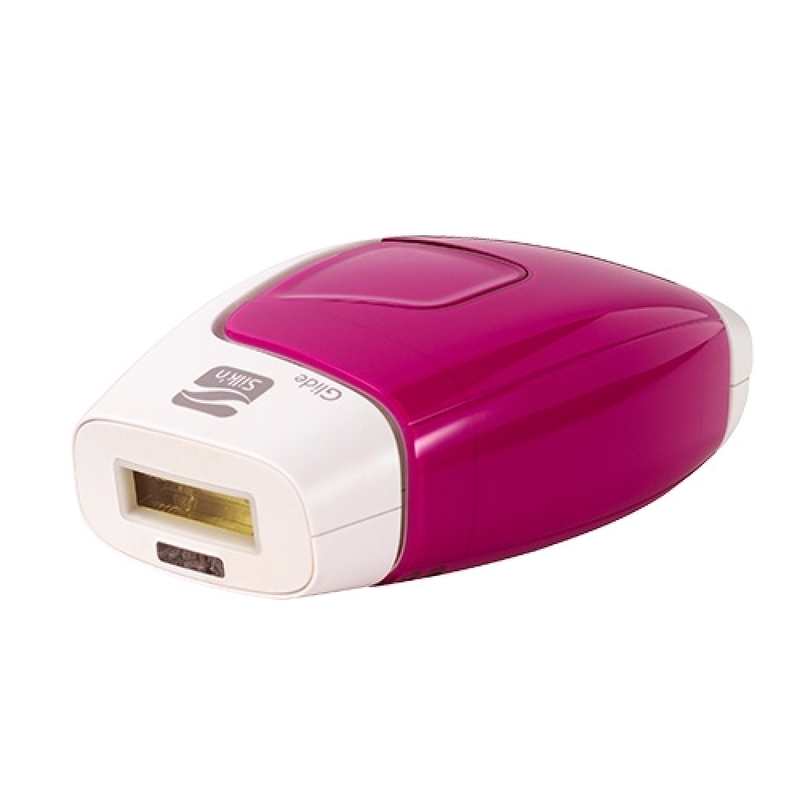 The Silk'n Glide 150,000 is a laser hair removal device that can be used safely and conveniently at home due to its use of home pulse light technology. This fantastic item comes with a stylish case, meaning you can even bring this ground-breaking product with you on holiday! The patented technology used by this unique hair removal device is safe, clinically approved and recommended by physicians. Additionally, it contains an unbelievable 150,000 light cartridges, this should mean you won’t incur any refill costs no matter how many full body treatments you undergo! The Silk’n Glide 150,000 emits pulses of light, which are transferred into heat to help disable future hair growth. 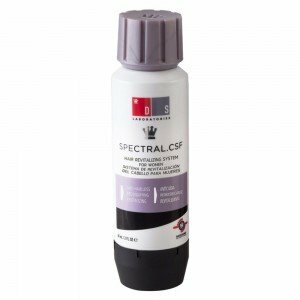 Unlike other similar devices on the market, it is suitable and safe for darker skin types, as well as skin that has been been exposed to the sun. This is due to the range of energy settings. There are five intensities of heat are available on the the Silk’n Glide, allowing you to discover the most comfortable and effective intensity of HPL for your skin! The Silk’n Glide 150,000 laser hair removal device works in two key ways: gliding and pulsing. The gliding method produces individual light pulses automatically every 1.5 seconds. It allows you to easily remove hair from the face and body by merely gliding the device over the zone of skin you wish to remove hair from. If you’re in a rush, this is the perfect way to remove unwanted hair! The pulsing option offers a more localised treatment and is suitable for use on smaller areas of skin. 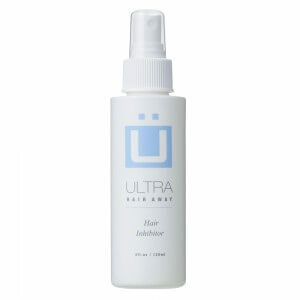 The individual pulses of light come at a higher intensity, great for targeting specific hairs. 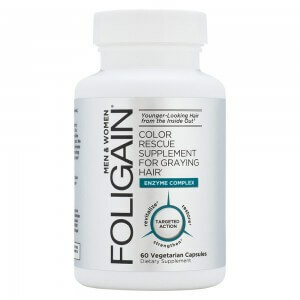 Depending on the size of area you are targeting to remove hair from will naturally change the your treatment duration. Silk'n Glide 150,000 laser hair removal device emits one pulse every 1.5 to 3.5 seconds, this depends on the intensity level it is set to. You can adjust this to suit your skin complexion, time available or size of area you are targeting. Generally speaking, we advise you should carry out 6-8 treatments on the area you wish to target. This should be done over the course of 2-4 weeks, in order for the Silk'n Glide 150,000 laser hair device to tackle the areas effectively. It’s important to note that at any one time some hairs are dormant and cannot be targeted by this product. Therefore, using this luxury device over long periods of time will allow you to remove these hairs as they become active. You should notice significant hair reduction after the first month of treatment, there after simply use the device as and when required. **These are times for how long each area takes per session. Many users report up to a 50% reduction in hair after just 3-4 uses of the Silk’n Glide 150,000; boasting the perfect opportunity to remove the maximum amount of hair with minimum effort! A variety of factors can influence the results though, such as hair type and colour. 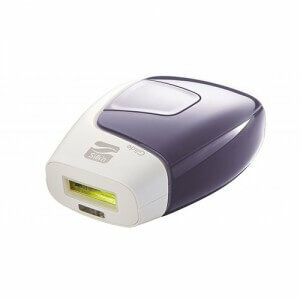 It’s generally advised that this hair removal device works best on lighter skin tones and darker hair colour. We advise using the Silk'n Glide 150,000 laser hair removal device regularly to guarantee all unwanted hair is removed. Using the Silk'n Glide 150,000 laser hair removal device couldn’t be easier. This innovative and ergonomically designed model works by simply choosing either the gliding or pulsing motion. 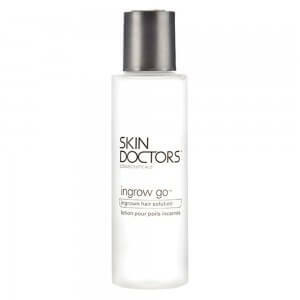 Take into consideration the area of skin you are targeting and your skin complexion in order to choose the correct one. The Silk'n Glide 150,000 is also FDA approved, meaning it is very safe to use. In fact, the entire Silk’n range harnesses the unique properties of home pulse light technology allowing effective use of this product in the home alongside top-quality results, all the while using only a fraction of the energy required for professional treatments! 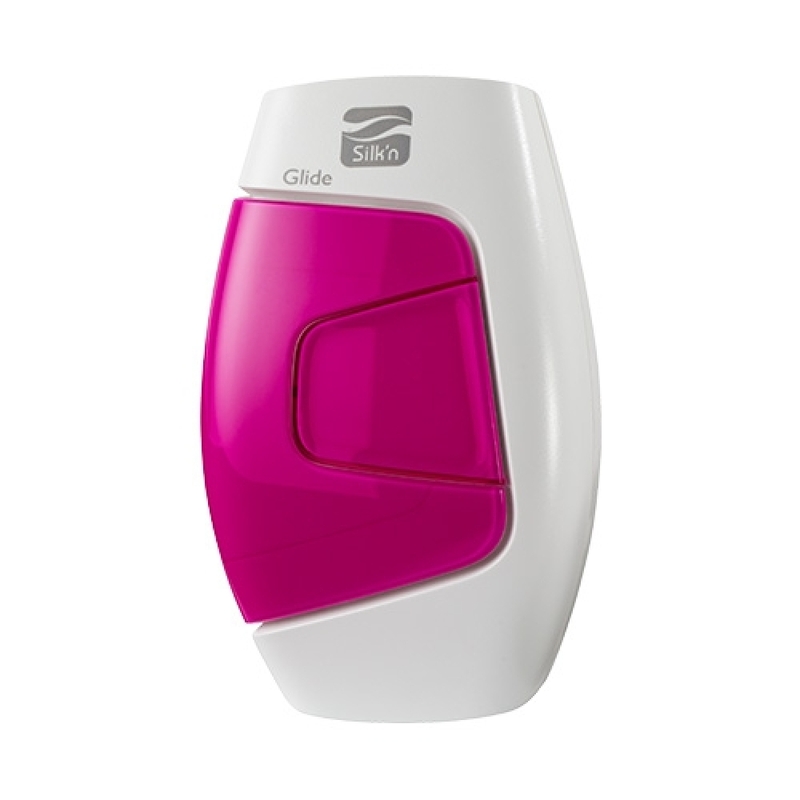 A skin sensor is included on the Silk'n Glide 150,000, adding an extra layer of protection on to your skin. It also emits a warning light when it is unsuitable for use, take note that the Silk'n Glide 150,000 only emits light when in contact with your skin, which removes the possibility of the light hitting your eyes. So no need to wear goggles! What do I get in my Silk'n Glide 150,000 box? How can I purchase the Silk’n Glide 150,000 from HairCareTotal? Buying your Silk’n Glide 150,000 from HairCareTotal is simple, secure and discreet. We offer free delivery on this luxury device and all orders received before 4pm on weekdays will arrive on your doorstep the very next day. To enjoy a revolutionary method of painless and effective hair removal as soon as possible, simply choose the 'Add to Basket' option!